Try using a food mill first. Im pretty sure if you use any kind of vinegar or citrus juice such as lemon or lime juice to thin your sauce a bit....it could only lower the ph ....i don't think it would go higher. I could be wrong but I am sure someone else will chime in. Add water in small amounts and test. If you add too much it can be boiled out. 50/50 5%vinegar/distilled water has a pH of around 2.6...25% vinegar/75% water will be around 2.75. If your sauce is 3.5pH either will be completely safe to just thin the sauce. I use a kitchen strainer. Shake it back and forth. The liquid will pass through leaving the larger stuff in the strainer. Edited by ShowMeDaSauce, 01 March 2018 - 12:48 PM. I think you're going to change the taste no matter if you add water, vinegar, or some combination as you will be diluting the fruits and peppers. 4oz of vinegar to 12-15 oz of sauce is definitely going to make it more vinegary. You might try using a little fruit juice (corresponding to the fruit you have in there) plus some vinegar. Pour some in a glass, measure pH, then add vinegar until the pH of the mixture is 3.5 then add that to your sauce. That's as good as I can think of to minimally change your sauce's flavor. Edited by jhc, 01 March 2018 - 12:48 PM. Not trying to hijack the thread. But it's in line with what I was going to ask. This mash is from dried Arbol chili pods they I soaked overnight in wine to rehydrate and it hasn't made much liquid at all. It's fermenting good and about a month old. No mold or anything. I bought a food mill to process it through. I don't expect it to make much after it runs through the mill so I wanted to thin it with something to get some volume. I don't want an overwhelming vinegar flavor on this one. I'm currently growing some cayenne and tabascos for that. I was thinking some rice wine vinegar and one of the nectars. Peach, mango, etc. Looking for a smooth/liquid type finish. Not sure of how much vinegar/juice to add. I would thin that out with water before putting it through the food mill - I think you'll recover more of it that way. You can always cook the water off later. Edited by jhc, 02 March 2018 - 01:57 AM. If 25% vinegar to 75% mixture is still at 2.75 ph, why would anyone just thin a sauce with straight or even 50/50 vinegar? As long as the sauce is already 4.0 ph, even a 10% vinegar/90% water mix should be lower than 4.0 (confirmation anyone?) So whats the point of just using straight vinegar or even 50/50 when you can mix a little vinegar with a substantial amount of water, get less vinegar taste, can smooth out your sauce AND still bring down your ph?? Vinegar is water anyway, it's 5% acetic acid to 95% water for dilution. So if you think the vinegar is strong but pH has room to play and you want it thinner you could use water. Easy. You can buy acetic acid also and use water in your recipe which is basically making vinegar in the pot. Many commercial sauces do this, you'll see acetic acid and water on the label. A lot of people like the taste of vinegar in hot sauces. Adding water just dilutes everything. But that's the nice thing about making your own - do it your own way and don't worry about what someone else might do. Agreed. Vinegar is the right balance when it provides the sharp tanginess familiar to hot sauce but doesn't stick out as tasting like vinegar. 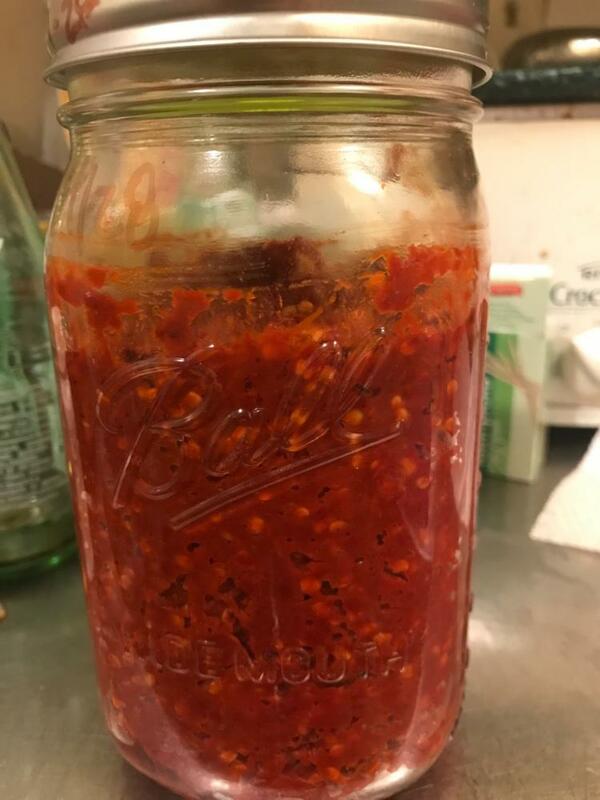 Hot sauce needs acid from vinegar or citrus for flavor not just preservation, or it tastes flat and not like hot sauce, or what we know as hot sauce. I grew up on Tabasco, so vinegar is something I enjoy in my sauce. I love vinegar in all it's forms. Tabasco is actually why a lot of people "think" they don't like vinegar in a hot sauce. It's one sauce that is too vinegary for me. Set water at 3.5 ph with some form of acid. Use it to dilute. Seems obvious and simple. And a very simple way if you dont want vinegar is lactic acid from a brew shop. Most sell small bottles of 88% for $5 or less. All you need is an accurate way to measure pH and some water. Edited by ShowMeDaSauce, 05 March 2018 - 01:25 PM.